I have a sad tale to tell. I took so many beautiful photos of these sour cherry magpies, and then I went and sat on my memory card (which I had left lying on my bed, idiotically) and it CRACKED! I lost so many photos it pains me to recall what exactly they were, but unfortunately only the top down photos I took of these Sour Cherry Magpies on my Samsung remain. I've learned my lesson and will no longer be leaving precious memory cards in miscellaneous locations. On a lighter note, my sister and I FINALLY made it to Rockaway Beach on Saturday (and now have sunburns!!!). I had no idea beaches like these existed in NYC. They weren't ocean-side Cape Cod beaches, exactly, but it was pretty awesome for being a subway ride away. I loved watching all of the surfers and just feeling like I had escaped the city in the oppressive weekend heat. After our beach going extravaganza, we hit up Rockaway Beach Surf Club, which has been on my bucket list forever, for some seriously amazing fish tacos and refreshing watermelon juice. It felt like an oasis somewhere far away and I can't wait to go back! Using a tracer, cut out 16 3"x5" rectangles of pie crust and place in the refrigerator for 15 minutes. Remove from fridge and place one layer down on the lined baking sheet. Spoon on several tablespoons of sour cherry mixture onto each square, leaving room around the edges. 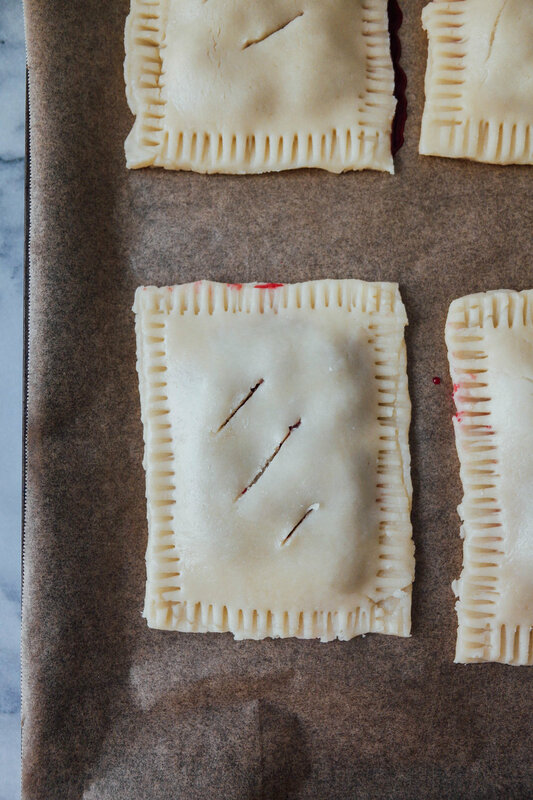 Top the cherries with a second layer of pie dough. Using a fork, close up the magpie around the edges and cut a couple slits in the top. Repeat with remaining dough rectangles. Give the magpies a quick egg wash and bake in the oven for about 20 minutes, or until golden brown. Let magpies cool and top with sour cherry glaze.